Please join the GSA for a Bowling Night at Mustang Alleys (1300 Bank St. 21231) on Thursday, March 7th from 7-9 PM. 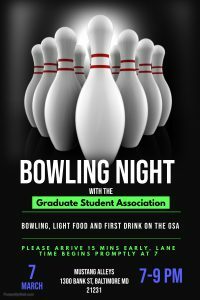 Tickets are 5$ and include two hours of bowling, light food, and your first drink on the GSA! There is limited availability so if you’re interested, make sure to register ASAP. Also, please arrive at least 15 mins early as lane time begins promptly at 7!